From a small fishing village, Biarritz became famous in 1854 when Empress Eugenie (the wife of Napoleon III) built a palace on the beach that is today the Hotel du Palais. This made Biarritz one of the trendiest destinations attracting the British royal family such as Queen Victoria, Edward VII, and other European royalty as Alfonso XIII of Spain. 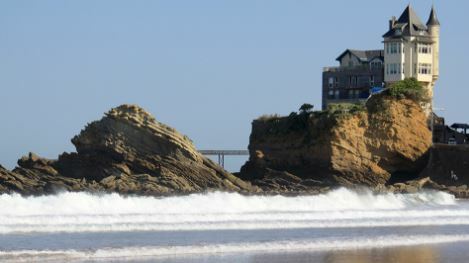 The resort became even more famous when movie stars such as Charlie Chaplin or celebrities like Coco Chanel bought huge 19th century villas and began to live in Biarritz. Moreover, the Basque region of France is somewhat unique as it has preserved much of its traditions and authenticity and this is noticeable through the language, architecture and cultural expression found in the region but even more so in the villages. Discover the authentic French Basque region located south of Bordeaux. First enjoy a panoramic tour of Biarritz. Then you will appreciate some free time in the town for personal discovery and lunch. In the afternoon, visit some of the most beautiful villages of the region like Aïnhoa, Sare or Espelette. Return to Bordeaux.